To get better control over your page titles, add a search engine sitemap and much more, we recommend the plugin WordPress SEO by Yoast. To install this plugin head to PluginsAdd New and use the search field to search for WordPress SEO. Once installed you’ll find it under SEO in your WordPress left navigation. SEOTitles & Metas is one of the tabs you might start with. 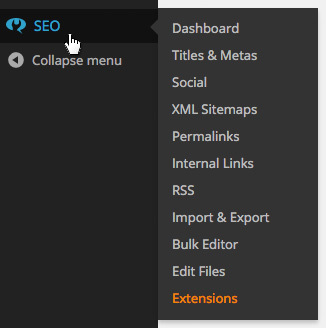 You’ll also find SEO options on each post and page, under the Visual Editor. Once installed you’ll find it under SEO in your WordPress left navigation.